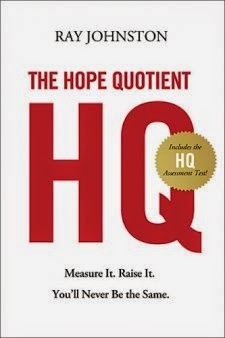 I received a copy of The Hope Quotient from Thomas Nelson publishers and was excited to get to it because I had never really thought of hope being something you could learn and increase. I thought you either had it or you didn't. Come to find out, I was wrong. I loved so much about this book. It read quickly, with lots of great lists and bullet points, which I love in a non-fiction book, and was 224 pages of encouragement. -Don't make decisions when you are down. -You get what you expect. These are not necessarily new concepts, in fact I know I've heard some version of all of these before in some context. But in this context, they really stuck out to me. I loved the chapters on Recharging Your Batteries and how important it is not to run till exhaustion but to take some time off to help yourself be the best of yourself. This is an area I really felt guilty about doing before and am now coming to realize how it helps not only me, but everyone around me. Definitely need to fit this into my bullet journal planning. It is so important. Another section stuck out to me too, and it was on burnout. He brought up the thought that maybe what I consider burnout is really just discouragement. I thought on that for a bit and for the most part, I think he's onto something. Going to let that roll around in my brain for a while too. This book was VERY encouraging. VERY good to read, and I will definitely be carrying around these thoughts for quite some time. In fact, I'm going to keep this one in my library to refer back to when I feel my hope diminishing and my discouragement increasing. I would definitely recommend reading this, especially if you are going through some trying times or feeling a bit hopeless and overwhelmed.